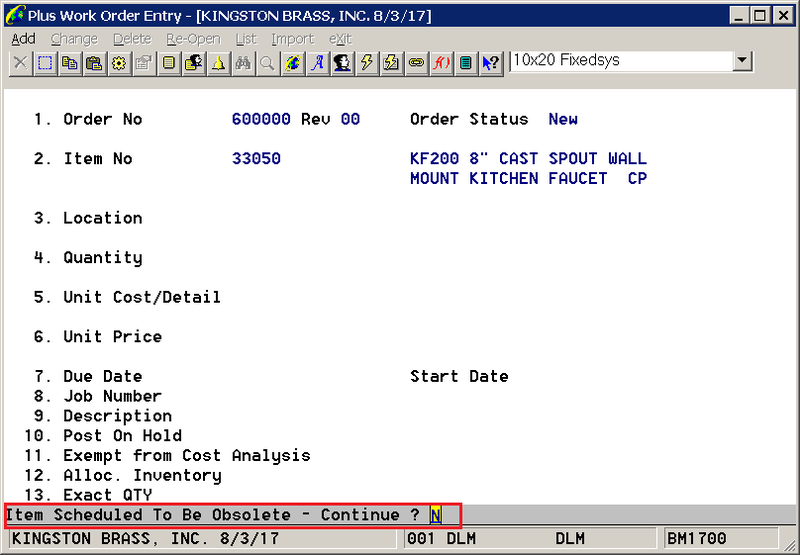 Currently, if an item is marked as obsolete, then Order Entry will not allow the item to be sold. This is controlled through Global Setup -> Cop-Func -> Order Line Item Screen, flag "7. 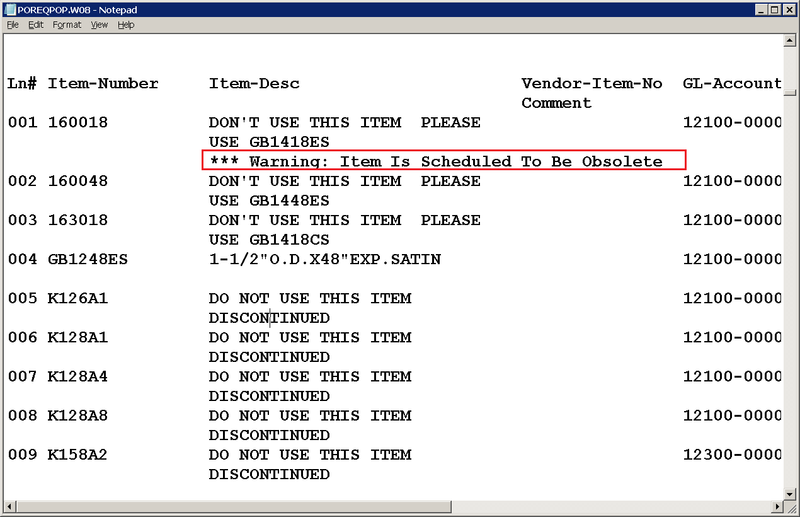 Allow Entry For Obsolete Item in COP Line Item." However, in many situations, there may still be inventory left and users still want to sell the stock before totally obsoleting the item. Therefore, the item needs to be set to "A" (Active). But in the meantime, there needs to be a way to prevent the purchasing of this item. The user can't be warned if the item stays as "A" (Active). The purpose of this feature is to address this need. 1. 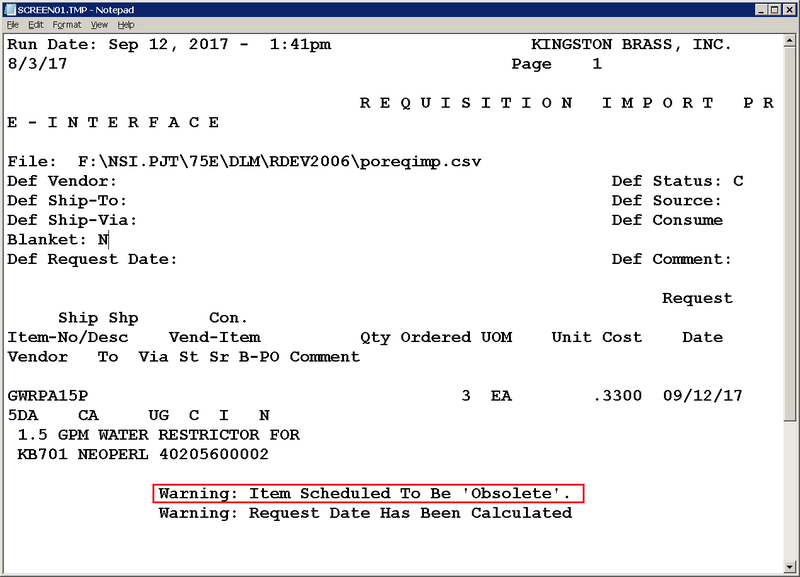 In IM-> Maintenance-> Item File, a Sub-cd of "O" for Scheduled Obsolete, may be entered if the Activity Code is set to "A." 2. 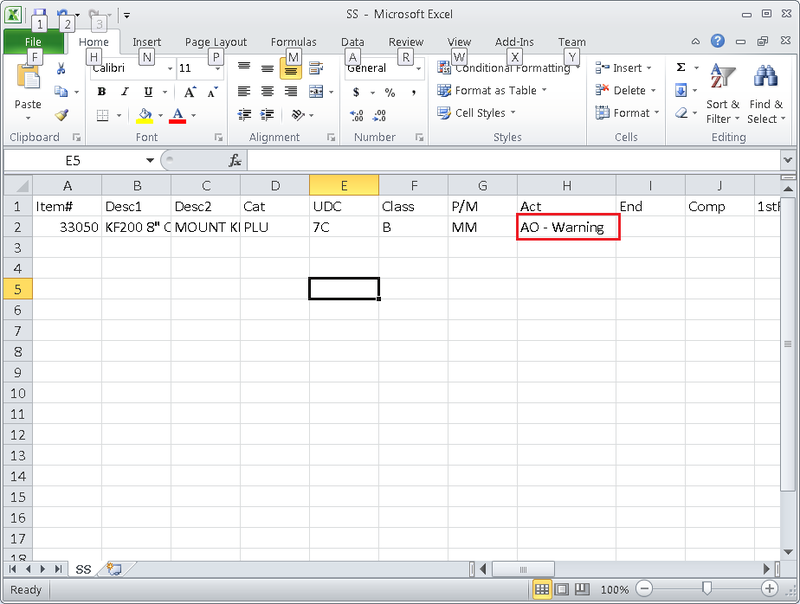 In IM-> Reports-> Reordering Advice Export CSV, if the Sub-cd is "O", the value "AO - Warning" will display in the Act column to alert the user that it is scheduled to become obsolete. 3) In IM-> Util-setup-> Change Existing Item Import, if the item has the Activity code "A," the item activity sub code is "O" and the Activity code is set to be changed to "O," the sub code will be changed to space. 4) In IM-> Maintenance-> Item file-> Purge/Obsolete Items, if the current Activity code is "A," the ASCII import activity code is "O," and the Sub Cd is "O," spaces will be moved to the Sub Cd field. 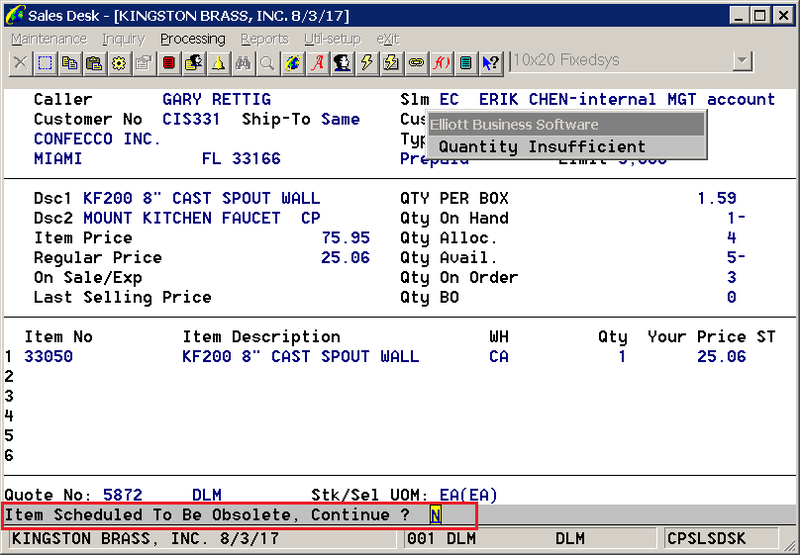 1) In PO-> Processing-> Purchase Order Processing, when entering an order for a line item if the activity code is "A" and Sub-cd is "O", the user is asked if it is OK to order the item. 2) In PO-> Util-setup-> Purchase Order Import-> ASCII file, a warning will be given on both pre-interface and the interface reports if the activity code is "A" and the Sub-cd is "O." 3) In PO-> Util-setup-> Purchase Order Import-> CSV file, a warning will be given on both pre-interface and the interface reports if the activity code is "A" and the Sub-cd is "O." 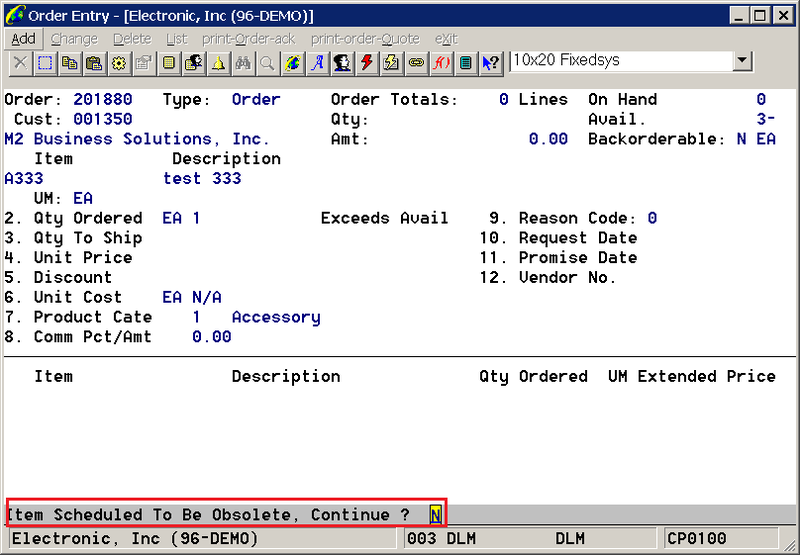 4) In PO-> Processing-> Requisition Processing-> List-> Requisition edit list, a warning will appear if the item activity code is "A" and Sub-cd is "O." 5) In PO-> Processing-> Requisition Processing-> Add, a warning is given upon entry of the PO requisition if the item activity code is "A" and Sub-cd is "O." 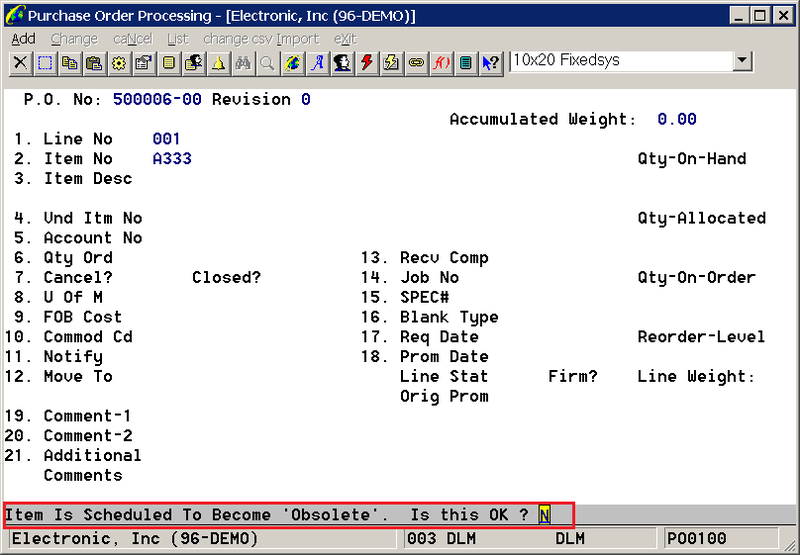 6) In PO-> Processing-> Post Requisition, a warning will appear if the activity code is "A" and Sub-cd is "O." 7) In PO-> Processing-> Requisition Processing-> Import, a warning is given if the item being imported has an activity code of "A" and a Sub-cd of "O." 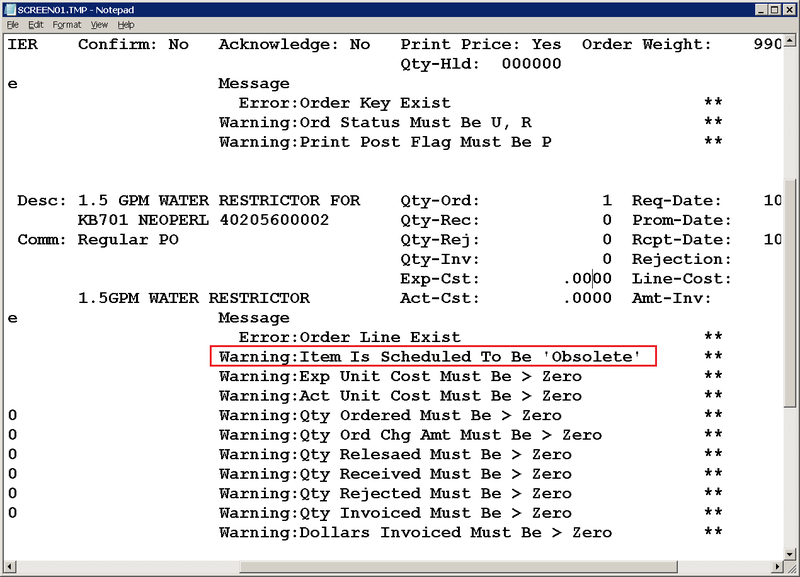 8) In PO-> Processing-> Requisition Processing-> Generate (from COP, from IM, from MRP, from ATP processing), a warning is given if the item for the requistion being generated has an activity code of "A" and a Sub-cd of "O." 9) In Util-Setup-> Global Setup-> Utilities-> PO Utilities-> Generate Buyers Desk Work File - this application will skip items that are active and have the sub activity code of "O." 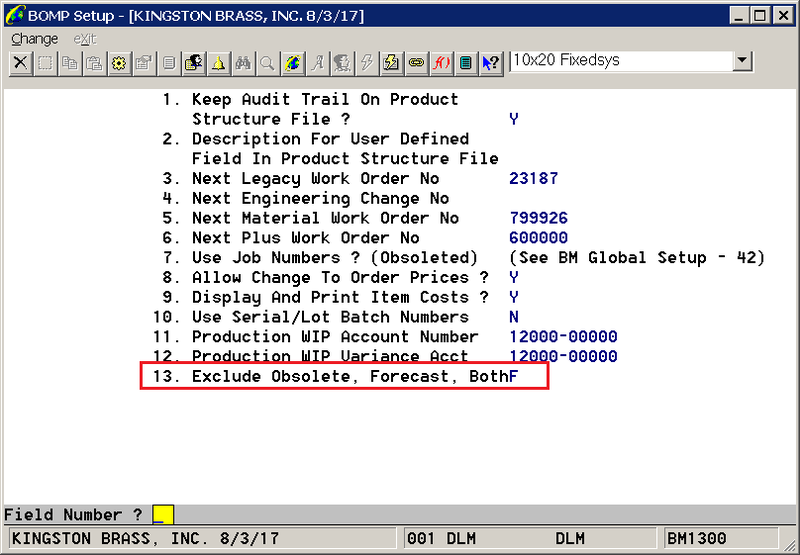 1) In BM-> Processing-> Production Order Entry, the application will check if sub code is "O" for the parent being produced. If it is "O" and the setup field "13. 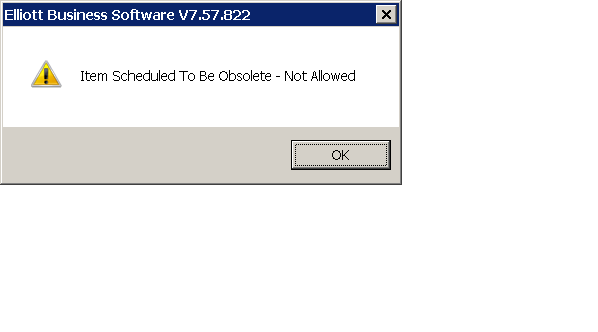 Exclude Obsolete, Both" is = "O" or "B," the program will prevent the user from entering the parent item. If the value is "F," a warning will be given. 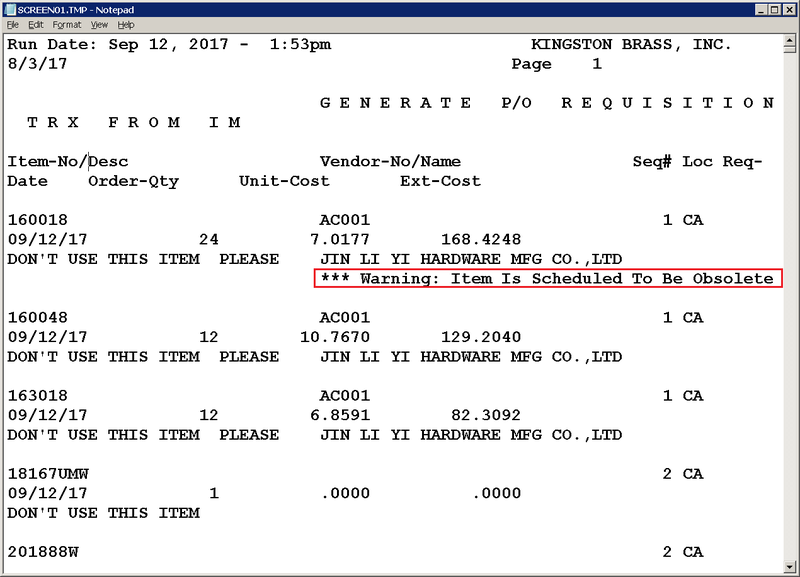 2) In BM-> Processing-> Production Order Entry-> Import, the application will check if the sub code is "O" for the parent being produced. If it is "O" and the setup field "13. Exclude Obsolete, Both" is = "O" or "B," the program will prevent the processing of the import record. If the value is "F," a warning will be given on the report. 3) In BM-> Processing-> Copy COP Orders into BOMP, the application will check if sub code is "O" for the parent being produced. If it is "O" and the setup field "13. Exclude Obsolete, Both" is = "F" a warning will be given on the report. 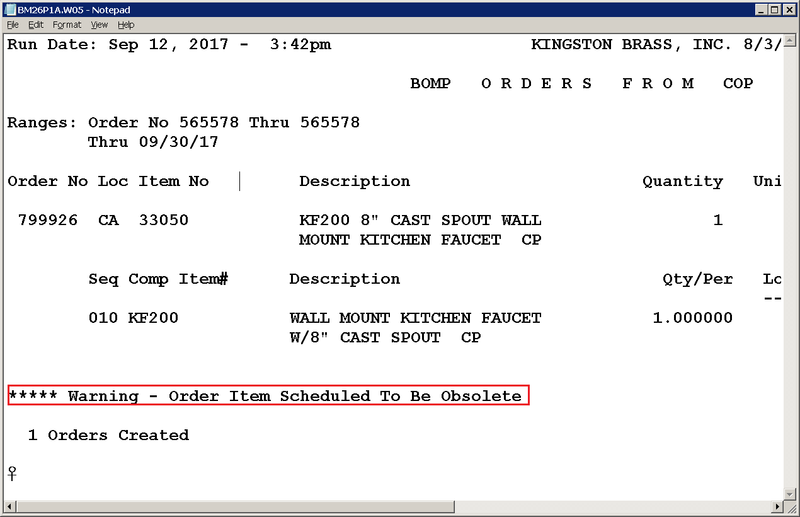 1) In COP-> Processing-> Order Entry, if a manufactured item is active but is scheduled to be obsolete and the quantity ordered is greater than the quantity available, entry will be prevented if the setup field "13. 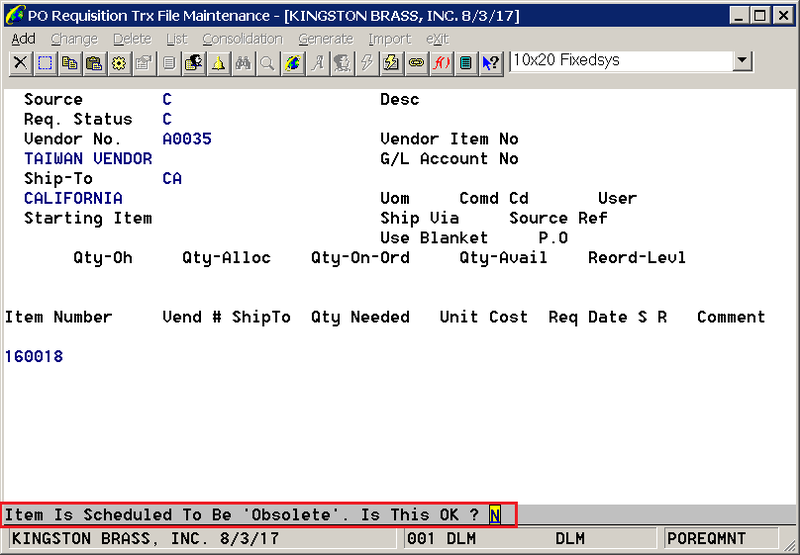 Exclude Obsolete, Both" is = "O" or "B." If the setup field is "F," a warning message will be given. 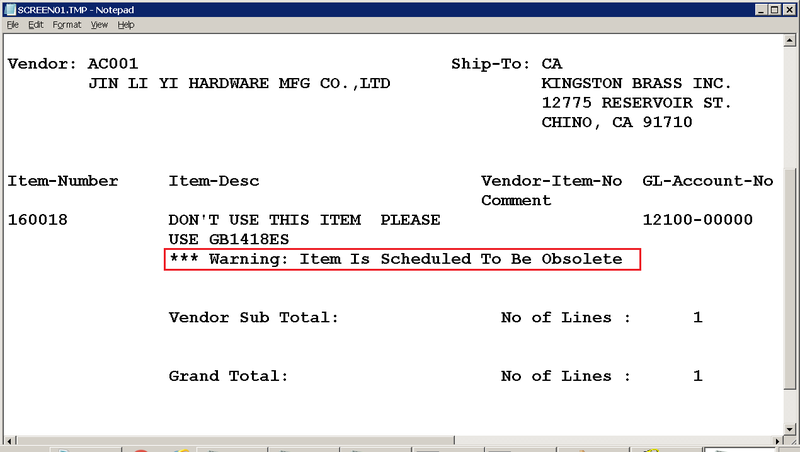 If the item is not manufactured but is scheduled to be obsolete and the quantity ordered is greater than the quantity available, a warning message will be given. 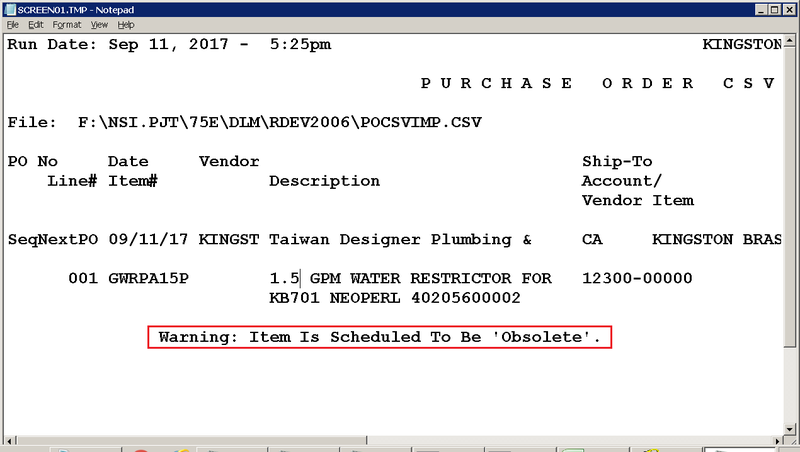 2) In COP-> Processing-> Sales Desk, if a manufactured item is active but is scheduled to be obsolete and the quantity ordered is greater than the quantity available, entry will be prevented if the setup field "13. Exclude Obsolete, Both" is = "O" or "B." If the setup field is "F," a warning message will be given. 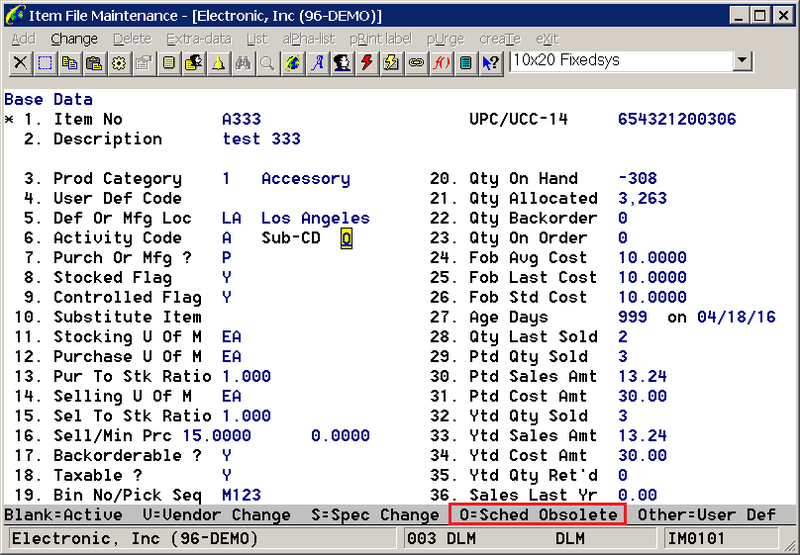 3) In COP-> Util-setup-> Sales Order Import, if a manufactured item is active but is scheduled to be obsolete and the quantity ordered is greater than the quantity available, and setup field "13. 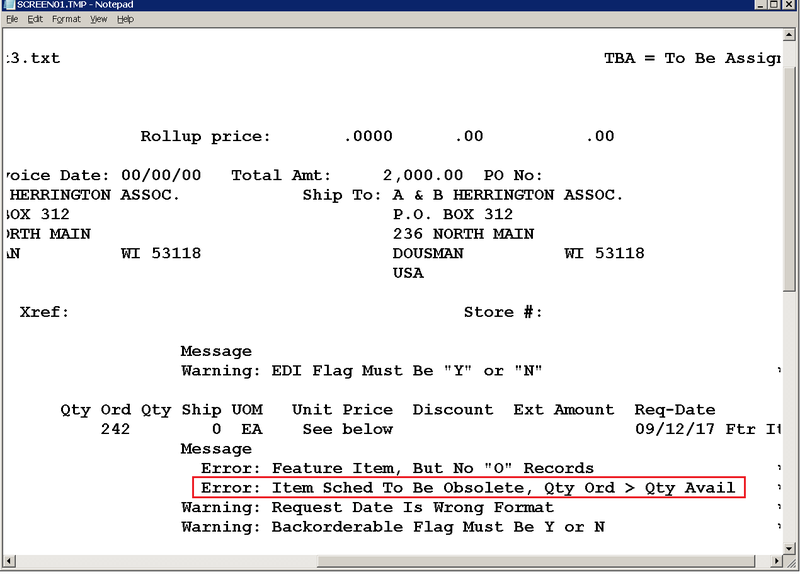 Exclude Obsolete, Both" is = "O" or "B," the import record will be flagged as Error. If the setup field is "F," a warning message will be given.